Every Cat Has a Tale: "Oh, Be Gone, Woman!" Just when you don't think there's anything else that 'takes-the-cake', something comes along that actually does. 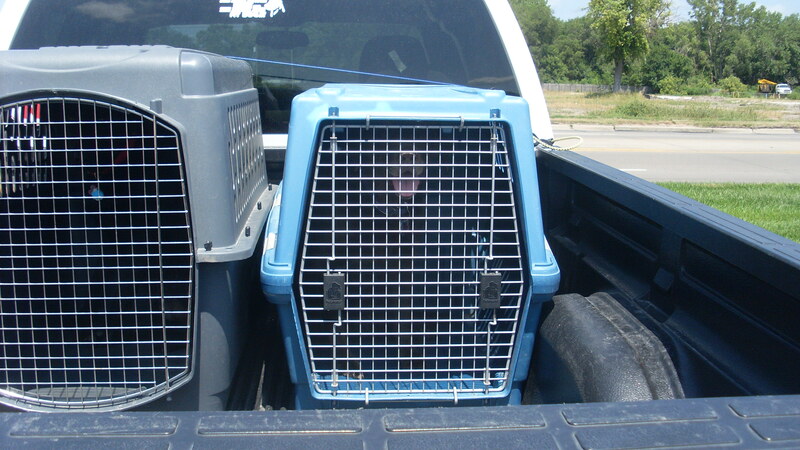 Going through the drive-in line: we notice a white pickup parked in the parking lot with two dog kennels strapped in the pickup bed; it was parked in the sun, and there were dogs in the kennels. The temperature on this day was 93 degrees; the vehicle was parked so the back-end was directly hit with the sun. We picked up our order and drove up alongside the pickup. The dogs in the kennels were panting hard, long pink tongues extended. I take my camera out of my purse, step outside the car, and snap a photo of the dog. Along comes the owner-- a big broad red-headed man & his wife. Us: "It's too hot for the dog." He follows with a defensive explanation about being in a dog show, about how the dog is "just fine", and he's getting angrier as he talks (he's turning red). His wife and I briefly touch on how it's a good thing that someone is concerned about animals, etc., and if it were just his wife and I together, I think we would have come out all right on this thing. Once more he emphasizes that 'the dog is okay, it's not too hot'-- this is where I say, "You climb in that box for an hour and see how it feels." He lost it-- he turns his back to me and says, "Oh, just BE GONE, Woman!" Suddenly, Joe's voice comes booming out of the car, "You don't talk to my wife that way, you D***!! !...and Joe continued to come up with about three more sentences emaphsizing his point, very clearly, very precisely. The guys wife, quietly: "Just get in the car, Honey." And we all drove away, eating our chocolate ice creams cones and ruminating on human intelligence, or the lack there-of. So glad you called him on the dogs! Me, too. Hopefully, if nothing else, this guy will be more careful with the dogs, even if it's just to avoid this type of thing-- poor critters, you should have heard them panting!